Sundays now mean one thing . . . football. It's amazing what a good man can do to your life. I've been #1 fan (nevermind the fact that he has video evidence of me sleeping through a recent game.) Our gameday menu usually includes pizza, wings or chili (all excellent choices.) But one crazy day, we actually ate a salad. It was a perfectly simple greek salad. Delicious and refreshing. Enjoy! Greek Salad 1 head romaine lettuce, roughly torn 1 tomato, largely cubed 1/2 cucumber, chopped 1 small red onion, sliced 1/2 cup kalamata olives, halved 1/4 feta cheese crumbled 1 tablespoon olive oil 1/2 tablespoon red wine vinegar 1 teaspoon fresh oregano, chopped salt and pepper to taste 1. Create bed of lettuce 2. 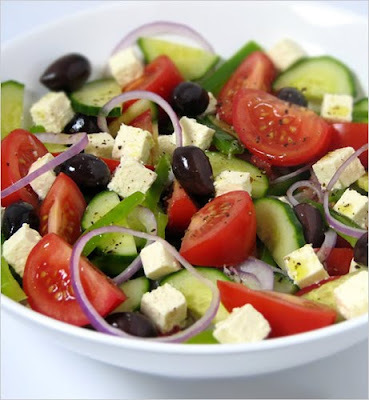 Top with tomatoes, cucumber, onion, olives and feta. 3. Mix oil, vinegar, oregano, salt and pepper and pour on top of salad. 4. Toss salad and serve.